Resident artists dress up and hand out candy! Don’t miss out on our 3rd annual Halloween fun! 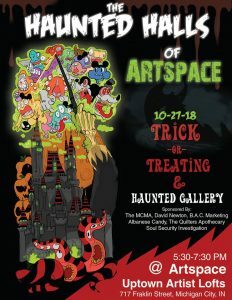 The haunted/themed house and CANDY GIVEAWAY at Artspace Uptown Artist Lofts has been a popular addition to Michigan City Mainstreet Association’s Flame + Flair Halloween Festival. Held on Franklin Street in the Uptown Arts District, the festivities include trick-or-treating at all of the downtown businesses, and a fire dancing performance to close out the night.